Janet Mills was elected Maine’s next governor on the strength of better-than-average support in traditional Democratic strongholds but also increased turnout in suburban and coastal communities that often split between Democrats and Republicans. Low turnout in many towns that regularly vote Republican didn’t hurt, either. Those trends, captured in unofficial returns from Tuesday’s voting, also likely helped lift Democrat Jared Golden into a runoff with incumbent U.S. Rep. Bruce Poliquin in Maine’s 2nd Congressional District and contributed to Democrats’ taking back control of the Maine Senate and extending their advantage in the House. Turnout is critical in every election but more so in midterms. The party that is in power often has to work harder to keep its supporters energized and the opposing party is more motivated to avenge a recent loss. Where turnout was up and where it declined played heavily into Tuesday’s election results in Maine. According to a town-by-town analysis of votes, Democrats had major advantages in voter registrations, early voting and in overall turnout. The rural-urban divide, which has been growing nationally for the past two decades, was evident as well, but that doesn’t tell the whole story. For instance, Mills, a former lawmaker and state attorney general, had major advantages in urban areas like Portland, Bangor, Lewiston and in college towns like Brunswick and Orono even though turnout in those places was either the same as 2014 or even slightly down in some cases. However, bedroom communities, especially affluent ones like Cumberland, Falmouth and Cape Elizabeth, saw massive turnout and they all tended to shift away from Republicans this election. On the other side, Shawn Moody, the auto repair shop chain owner from Gorham, carried most conservative-leaning towns but in many instances he didn’t do as well as LePage did in 2014. He even lost some towns that LePage won. Ben Grant, a former Maine Democratic Party chairman who has been tabbed to help lead Mills’ transition team, said the numbers didn’t surprise him. According to the Pew Research Center, which studies voting trends, the political divide between rural and urban voters has been growing over the last 20 years. In 1998, 55 percent of urban voters identified as Democratic. Now, it’s 62 percent. The number who identify as Republican in urban areas has fallen from 37 percent to 31 percent during that time. By contrast, the percentage of rural residents who identify as Republican has increased from 44 percent to 54 percent, while the number who consider themselves Democrats has dropped from 45 percent to 38 over the same time. Suburban residents have stayed constant over 20 years, although there are slightly more Republicans now, 42 percent to 45. However, voters in those areas are most likely to swing back and forth between Republican and Democrat, as a whole, depending on the election. Maine has seen these shifts, too, and this year Democrats saw a big swing from suburban voters. Registration and early voting data foreshadowed a good election for Democrats. By the end of September, Democrats had added 27,310 new registered voters since 2014 – almost double the number of new Republicans over the same time, 13,778. Similarly, early voters favored Democrats. By late October, a little more than 60,000 Democrats had cast ballots early compared to about 40,000 Republicans. Falmouth had the highest turnout among all towns – 83 percent, up from 73 percent four years ago – and Mills held a 22-point advantage there. Gov. LePage trailed by just 2 points in Falmouth when he was re-elected 2014. Several smaller coastal communities up and down the Maine coast – Deer Isle, Sedgwick, Tremont, Stonington, Southwest Harbor – increased their turnout from 2014 to 2018. They all went heavily for Mills. Then there were towns like Harpswell, which had virtually the same turnout this year as it did four years ago but it shifted heavily toward Mills. She won the town by 18 points, compared to four years ago, when the town favored the Democrat, Mike Michaud, by just 4 points. Grant said he attributes Mills’ success, and the success of other Democrats, to overperforming in rural areas. He said he remembers watching results come in four years ago. One of the first towns was Albion, which went heavily for LePage. He figured it would be a tough night. This year he saw Albion come in early again. Moody won but not nearly as convincingly as LePage. Grant also said Democrats benefited from strong support among unenrolled voters. “You can’t win the way she did with just your own party,” he said. 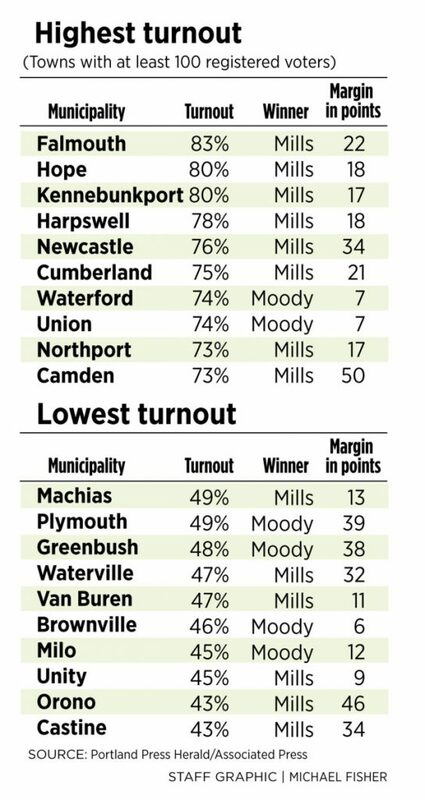 Just as Mills was buoyed by high turnout, Moody – and Poliquin, too – were hampered by pockets of low turnout. Two years ago, many Maine towns that had voted heavily for President Barack Obama in 2012 swung to Trump. The Democrat carried the town of Mexico by a 67-26 percent margin, but Trump won 50-42 percent over Democrat Hillary Clinton four years later. Skowhegan, for instance, went narrowly for LePage in 2014 but this year – with 9 percent fewer voters – Mills carried the town by 2 percentage points. That dynamic played out in smaller, conservative towns across the state. Dexter and Madison, two former mill towns, saw turnout drop 9 percent each. Moody carried both. Another example was Turner, which is reliably Republican. Moody won the town by 24 percent, but that was down from LePage’s 37-point advantage in 2014. And turnout there decreased 9 percent. In the town of Corinth, Moody did about as well as LePage but turnout was lower – 57 percent compared to 64 percent in 2014. In Greene, which Moody also won by a similar margin as LePage, the drop was even more precipitous. Only half of registered voters turned out this year, down from 69 percent in 2014. Many conservative towns with low turnout were in the 2nd District, and Ellis, the former Maine Republican Party chairman, said he thinks the deluge of negative advertising in that race may have prompted many to stay home. Outside of the 2nd District, Windham was an interesting example. Moody won that town – which is next door to Gorham – but only 51 percent of voters turned out there, down from 67 percent four years earlier. There were some interesting shifts from 2016 to this year as well. In several towns – including Machias, Lubec, Clinton, Farmington and Fairfield – Republicans lost at least 10 percent of votes. Towns in Maine that went really strong for Trump – Hartland, Medway and Mexico, again – did not go nearly as strong for Moody or Poliquin. Ellsworth was another fascinating study. The Hancock County town has always been Republican-leaning and still has more registered Republicans than Democrats. It went for Trump in 2016 and LePage in 2014. This year, with 10 percent more votes cast than in 2014, Ellsworth supported Democrat Golden over Poliquin and Mills over Moody. Maine clearly has a recent history of major swings from one election to the next. What will 2020 – when Trump will be up for re-election – bring? Grant said, as a Democrat, he hopes there isn’t another swing waiting in 2020.